Obama’s Cairo Speech: A New Beginning or the Old Hypocrisy? Thousands of words could easily be written about whether or not Obama met or dashed these hopes in his wide-ranging speech at Cairo University. Did he rise to the challenge of the century with respect, grace, and compassion? Or did he take the occasion to endorse continued Israeli hegemony, American imperialism, and Western power over indigenous people and cultures? Are we to laud his Qur’anic quotations, his denouncement of negative Islamic stereotypes, his use of the terms colonialism, occupation, and Palestine? Should we marvel at his understanding that, as a direct result of Western imperialism and the Cold War, many Muslims were “denied rights and opportunities” and that Muslim countries were “treated as proxies without regard to their own aspirations”? Should we be thrilled by his acknowledgement that Iran, as a signatory to the Nuclear Non-Proliferation Treaty, has the inalienable “right to access peaceful nuclear power” even though he never mentioned Israel by name when saying that “no single nation should pick and choose which nation holds nuclear weapons” and pointing out “that some countries have weapons” while “others do not.” What about his extraordinary admission that “the United States played a role in the overthrow of a democratically elected Iranian government”? Should we dance the hope-and-change two-step because Obama acknowledged the “undeniable” suffering, displacement, dehumanization, and “legitimate aspirations” for dignity, opportunity, and statehood of the Palestinian people? Should we spend time comparing and contrasting the adjectives “unbreakable” with “intolerable”? Should we be encouraged by Obama’s reference to Israel’s “right to exist” that deliberately didn’t include the usual ethnocentric qualifier, “as a Jewish state”? What about his bold rejection of on-going illegal Israeli settlement activity? His association of the Palestinian resistance to occupation and desire for “full and equal rights” to the African-American struggle against the brutality of slavery and the “humiliation of segregation”? His juxtaposition of the Palestinian narrative with that of Apartheid South Africa? What are we to make of Obama’s soaring rhetoric and inspiring calls for unified humanity? What about the staggering hypocrisy? How passionately should it be pointed out that, as Obama declared his “relentless” commitment to “confront violent extremists” who threaten the American people and his outright rejection of “the killing of innocent men, women, and children,” unmanned Predator and Reaper drones, adorned with the stars and stripes, were screeching through the skies over Afghanistan and Pakistan, perhaps adding to the appalling death toll already racked up by the young Obama Administration. Should people be reminded that, just one month ago, these murderous air strikes took the lives of over 120 Afghan civilians in the village of Granai in a single day? What about the fact that, in his first 100 days, the new president has managed to create over two million Pakistani refugees? While mentioning how the events of 9/11 traumatized the American people, claiming that the United States of America is not some “self-interested empire,” and declaring that the actions of “extremists” are “irreconcilable with the rights of human beings, the progress of nations, and with Islam,” Obama omitted any mention of the 700 US military bases that dot the globe or the four million Iraqi refugees created by the US invasion of that country. He said that al Qaeda has “killed people of different faiths – but more than any other, they have killed Muslims.” Obama then didn’t mention the one million-plus dead Iraqis that Al Qaeda didn’t kill over the past six years, the same million people the United States did kill. Obama quoted the Qur’an by saying that “whoever kills an innocent, it is as if he has killed all mankind” and that “whoever saves a person, it is as if he has saved all mankind.” So then, how many mankinds have the US military obliterated in its attempt to protect Americans half a world away? Consider this: if the word “America” were changed to “Palestine” and “al Qaeda” to the “Israeli military,” the president would have been talking about Israel’s devastation of Lebanon in 1982 and 2006, bombardment of Gaza this past winter, and stated determination to attack Iran. Of course, these connections were not made by Obama. Obama’s plea for peaceful resistance and denouncement of violence is certainly commendable, especially for a US president. But something doesn’t quite seem right. He addressed these remarks only to Palestinians, once again affirming the propagandistic narrative that Arabs engage in immoral terror while Israel acts only in necessary self-defense. This is absurd. Not a single word was said about Israel’s deadly attacks on the locked up and starving population of Gaza, during which the Israeli military killed over 1,400 Palestinians – 85% of whom were civilians – including over 400 children. Obama didn’t feel the need to condemn the use of US-supplied missiles and bombs, white phosphorus and DIME, tanks, bulldozers, drones, and bullets to murder the sleeping children and terrified elderly of Beit Lahiya, Beit Hanoun, and Jabalya. Apparently, Obama doesn’t feel as if Israel surrendered its moral authority by keeping Palestinians under military occupation for a quarter century, for arresting and sometimes lethally shooting those who peacefully protest against the continued annexation of Palestinian land (17 Palestinians protesting the Wall have been killed by Israeli soldiers since 2004), or for keeping thousands of Palestinians in Israeli prisons for years without charges or trials. Israelis who protest their state’s aggressive and racist behavior are vilified; the courageous youths who refuse to serve in the occupation are imprisoned. Nor was the irony more shameful as when Obama asked the “Palestinians to focus on what they can build,” without adding that, during the Gaza assault, Israel destroyed over 5,000 homes, 16 government buildings, 20 mosques, and many schools, universities, and hospitals. Israel attacked ambulances, UN installations and shelters, food warehouses, factories, and energy plants. Clearly, although Obama called for an end to illegal settlement activity in the West Bank (and made no mention of dismantling existing Israeli colonies and outposts which are each and every one of them illegal under international law), the continued building and maintenance of Israeli checkpoints, watchtowers, Apartheid Wall, and segregated bypass highways that bisect Palestinian land was not questioned. …Israel must also live up to its obligation to ensure that Palestinians can live and work and develop their society. Just as it devastates Palestinian families, the continuing humanitarian crisis in Gaza does not serve Israel’s security; neither does the continuing lack of opportunity in the West Bank. Progress in the daily lives of the Palestinian people must be a critical part of a road to peace, and Israel must take concrete steps to enable such progress. These are fine words from the most powerful person on the planet and it should be the hope of all advocates of human rights and international law that Obama follows up these demands and suggestions with action. 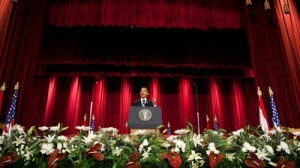 There is always the fear that lofty goals and pretty speeches serve to strengthen Israeli means to meet American ends. But, with Obama’s overtures in Cairo, there may now be the possibility of a better start.